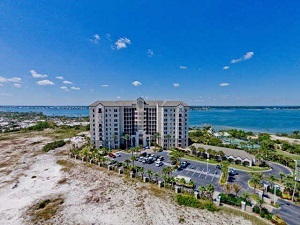 Perdido Key Florida waterfront condo for sale at Florencia. 4BR/3.BA unit w/ newly updated carpet and paint throughout condo. Most unique floor plan on Perdido Key. Four (4) sides of this condo are exposed creating one-of-a-kind acoustic privacy. Open concept living room & kitchen, four (4) bedroom spacious condo. Condo is contiguous to the Perdido Key State Park. Ole River views with a private beach on ole river and gulf beaches just a short distance.